If you're going to create a new mythology from the ground up, as Jack Kirby was apparently trying to do with the New Gods, you could certainly do worse than to throw in some complex family relationships. The son of Darkseid and Suli, Kalibak longs for the approval of his father. This desire has led to an ongoing rivalry with his half-brother Orion. He is nearly equal to Orion in terms of strength and fighting ability. A member of Jack Kirby's New Gods, Kalibak is a bruiser who is constantly seeking his father's approval. (Suli appears to have been a relatively normal-looking woman, so apparently Kalibak's good looks come purely from his father's side of the family.) He hates his half-brother Orion, whom Darkseid admires despite the fact Orion has sworn to destroy him. 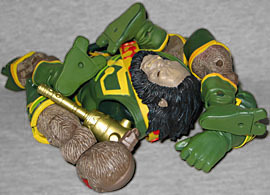 Most appearances of Kalibak, in both comics and cartoons, involve him getting into a knock-down, drag-out battle with Orion or Superman, with lots of property damage. One of the best is in the Justice League episode "Hereafter," where Lobo piles car upon car on top of Kalibak until he cries uncle. 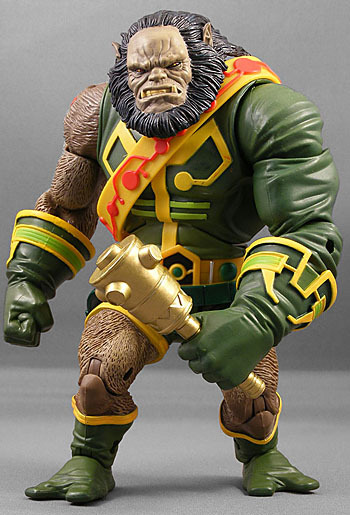 Kalibak is the "Collect-​and-​Connect" figure for DC Universe Classics Series 6. He comprises five pieces: the torso/head, arms and legs. Be sure to push his shoulder joints in all the way - they'll lock in and won't come off easily. 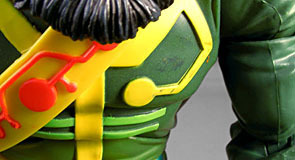 Previous Mattel BAFs have had some trouble with the pieces staying together, but Kalibak doesn't share them. Articulation is what you expect from this line: balljoint head; hinge at the neck; balljoints at the shoulders; swivels at the biceps, waist, and wrists; hinges at the elbows, knees, ankles, torso, and an H-hinge on the hips allowing for a balljoint-like range of movement. No need to worry about the joints breaking, either, which puts him above most DCU Classics figures. The only major flaw on my figure is that the lower torso is molded in a brighter green plastic than the rest of him. There are some other minor paint issues, but nothing glaring. 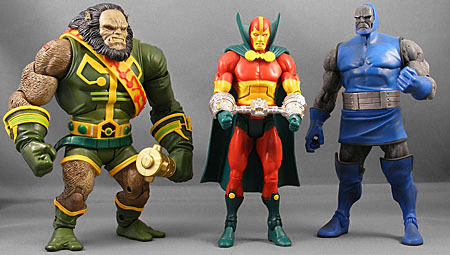 At his straightest, Kalibak stands 7⅛" tall, and the overall sculpt is more good work by the Four Horsemen. His face is rather like a cross between a lion and a gorilla, with a huge "mane" of black hair falling back over his shoulders. His green outfit leaves the right arm exposed, and it and the legs are sculpted with a fine coat of fur (other than Kalibak's knees, which are perfectly smooth). The costume, based specifically on one Kirby pinup rather than his usual comics design, has all the various embellishments sculpted onto the surface, not merely painted. 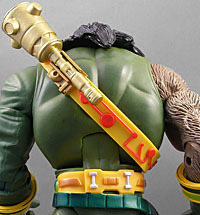 Kalibak comes with his one accessory, his signature weapon, the Beta-Club. Kirby usually drew it as little more than a golden, mechanical-looking club. 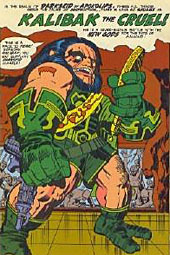 When it came time to add Darkseid's ill-favored son to the 1980s Super Powers line (source of so much inspiration on the Horsemen's work for this line), the Beta Club was given a more unique design. Mattel and the Horseman had hoped to include both the comic-accurate Beta Club and the Super Powers version in Series 6, but that didn't cost out, so it will now be included with Series 8's Parademon. Like most DCUC figures, Kalibak is pretty durable compared to other collector figures. Despite the top-heavy body and smallish feet, the figure stands very well on its own. You can put the club in his left hand, or clip it onto his sash. To put Kalibak together, you have to get Shazam, Killer Moth, Hawkman, Superman (either variant), and either Mister Miracle or Dr. Impossible. That will run you a minimum of about $60, but it means you get five 6" figures and one deluxe-size figure, which is an average deal in today's market, if not exactly a bargain.